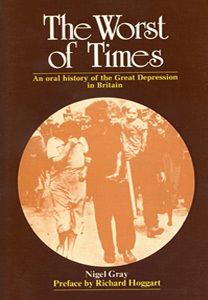 The Worst of Times is a series of personal recollections of working-class life during the Great Depression of the 1920s and1930s in Britain. Based on interviews with men and women from Aberdeen to South Wales and from London to Durham, the book reveals the injustices, hunger and brutality they experienced, while it also brings out the solidarity, resourcefulness and political determination of their lives. The book vividly evokes day to day experiences: the Means Test, the soup kitchens, the hunger marches, the evictions, the strikes and the general poverty and exploitation, which are all remembered in these pages and retold with a mixture of anger, bitterness, and often wry humour. The Worst of Times will surely be regarded as a major social document of the twentieth century. I congratulate Barnes and Noble with all my heart for publishing The Worst of Times by Nigel Gray. I would do so no matter what of his they published, since I have long been an admirer of his writing and his superhuman calm when describing the hardships inflicted on the British working class by greed and carelessness. He is a superb historian of what has really mattered to at least half of his society during most of this century, in his fiction as well as his reportage, and so is an invaluable colleague for anyone who wants to know what life is really like before formulating plans to make it better. A revelation. A must for even the most bare book collection.